In order to find the best tankless water heater for your home, important considerations must be made. With a tankless hot water heater you never have to worry about supply, like with storage tank units. But what should be accounted for is the hot water demand. Fortunately for energy savings minded homeowners, tankless units are flexible and can be applied in several ways to more efficiently serve your hot water needs. So depending on your needs, a whole house tankless water heater will best apply or one of several different point of use water heater applications in conjunction with a separate primary unit would be ideal. Using a bucket or any container, gather water from the fixture for 10 seconds. Then use a measuring cup several times if needed calculate the amount of water. Multiply the amount of water by 6 in order to get the flow rate per minute, (10 sec x 6 = 60 sec) (60 sec = 1 min). Flow rates for hot water consuming appliances such as washing machines and dishwashers can be obtained by referencing the appliance owner's manual or by contacting the manufacture. The temperature of the water flowing through your incoming plumbing pipes is called the ground water temperature or ambient incoming water temperature. 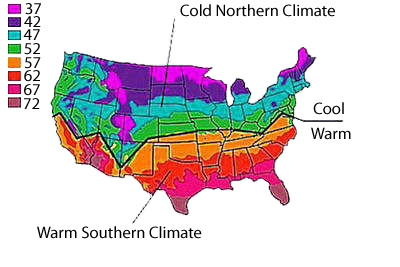 This temperature is determined by your regional climate. Knowing your incoming water temperature is as equally important in respect to selecting the best tankless water heater for your home as calculating flow rates. Tankless hot water heaters are rated by the temperature rise at a certain flow rate or gallons per minute. The temperature rise is simply the difference between the desired hot water temperature and the cooler ground or ambient incoming water temperature. Determining a proper temperature rise at a comfortable flow rate is essential to selecting the best tankless hot water heater for your home. So what's the best tankless water heater for your home? Suppose you live in Atlanta, Georgia and you're considering replacing your current storage tank unit. The average ground water temperature is 62 degrees. You also enjoy hot relaxing showers so you desire a hot water temperature of 110 degrees which is the recommended outgoing hot water temperature. You have a moderate size family, so understandably you need a tankless unit that can provide the same hot water temperature to two shower heads and your kitchen sink at the same time. If you reside in central New Jersey and you're not necessarily looking to replace your primary water heater, but you're looking to improve efficiency by supplying a bathroom that's far removed from your primary source.